We have 2 campsites that require wardens from Friday- Sunday, the central brighton campsite is situated in woodingdean, and attracts large groups wanting to use the site as a cheap living alternative to access the town centre. So this means the campsite has a very lively vibe and has very busy periods on friday night checkin and sunday check out but the rest of the time can be empty. Alternatively the Riversite by Steyning west sussex (25min outside brighton) has a very kicked back approach and is mainly attracting families and large groups of friends eager to take advantage of the river or bushcraft activities. Fancy a yoga class whilst at your campsite? 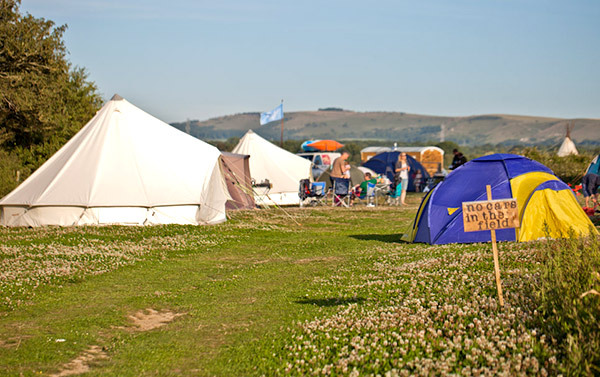 Pop Up Brighton Campsite situated ten minutes by bus into Brighton city centre is offering Saturday morning yoga classes in the field and massage and aromatherapy in the bell tent. The campsite offers a variety of tents to suit different budgets ranging from a bell tent starter up to motel package and B&B group and with toilet, shower and electricity. You can have a relaxing time at the yoga class and the enjoy the fun of Brighton. To find out more about our excellent Yoga teachers click here to visit the Ocean Bay Yoga website. We are very excited about our new Shepherds Huts that are presently being built and are soon to have excellent interiors to make any camper suitably happy and comfortable. These splendid huts are full of character and as you can see have a porch area, are risen up off of ground level to elevate you and yours to superior camping accommodation heights. We are working on a family version and all of our huts are going to be super neat and a place that will truly feel like home amidst their wonderful countryside location.